Looking to expand your PPC campaigns into social media but aren’t sure what works or where to start? 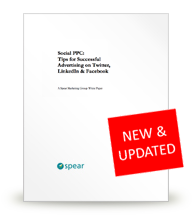 Learn proven tips and techniques for how to create, deploy, and manage successful ads on the big 3 social networks, in a newly updated white paper from the B2B demand gen experts at Spear Marketing Group. Request your free white paper. why you should ignore LinkedIn's "minimum bid levels"
To receive monthly tips and insights on demand generation, lead nurturing, marketing technology, and more, be sure to subscribe to our blog, The Point, by checking the box where indicated.